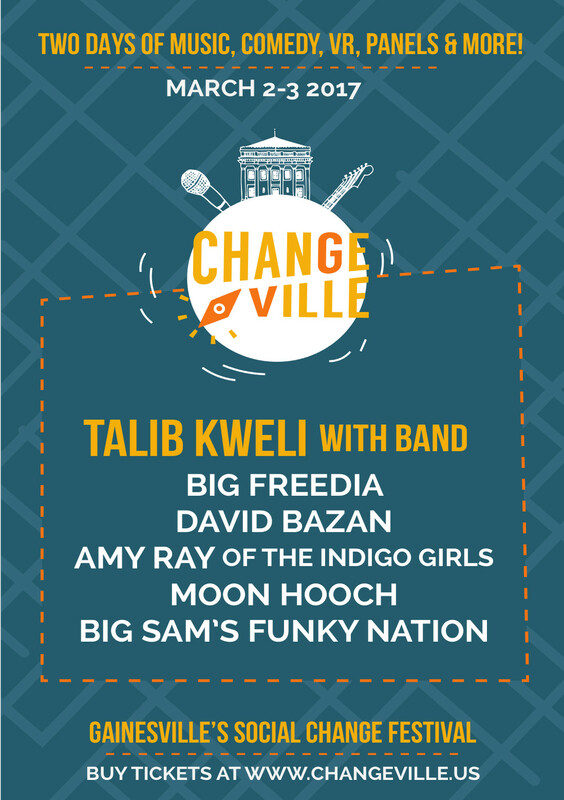 Changeville, a two-day social change festival in downtown Gainesville will take place Thursday, March 2 through Friday, March 3, and will feature music, comedy, films, virtual reality installations and discussion panels. An after-party event is planned for Saturday, March 4. A concert and street fair in the downtown plaza will feature Hip Hop artist and activist Talib Kweli, and New Orleans funk/jazz/rock artist Big Sam’s Funky Nation. Other events will take place at downtown venues including the Civic Media Center, Hippodrome, High Dive and Loosey’s. Music headliners include Moon Hooch, David Bazan, Amy Ray (of the Indigo Girls), and local artists relevant to positive social change. Panel discussions and meet-ups will combine artists, activists, and speakers from UF’s frank conference. All-inclusive festival passes are on sale for $29 (early-bird) and $15 for VIP front row tickets to the Plaza show. Tickets for individual events are also available. 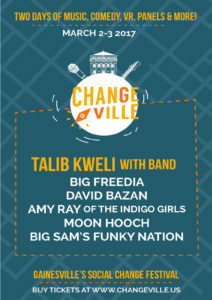 Changeville has previously brought to Gainesville such acts as Charles Bradley and The Preservation Jazz Hall Band. The festival is expected to bring over 6,000 people to the events and downtown venues, restaurants and hotels.